My friend, Shannon, is organizing the Recreate Project, an art show and silent auction to benefit Invisible Children and To Write Love on Her Arms. She put out a call to artists to contribute a project that recreates a famous work of art. All pieces included in the show will be auctioned off in a silent auction and the proceeds will go to both charities. I recreated this painting with a stack of Kona charm squares from Pink Chalk Fabrics and a few extra solids from my stash. 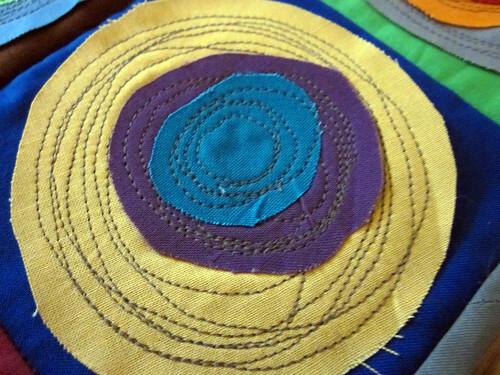 I attached the circles with machine applique. I had originally tried to use my free motion foot to do the applique but found that the regular presser foot worked better and allowed me to feed the fabric to stitch in a circular motion. The final size is 18" x 13.5". I stitched in the ditch between the squares and binded it with a solid gray from the stash. PS. Shannon writes the most delicious food blog, Bread and Jam. Check it out here. I finished the quilt top for this back in November (see here) and it's been languishing in my overstuffed craft closet ever since. 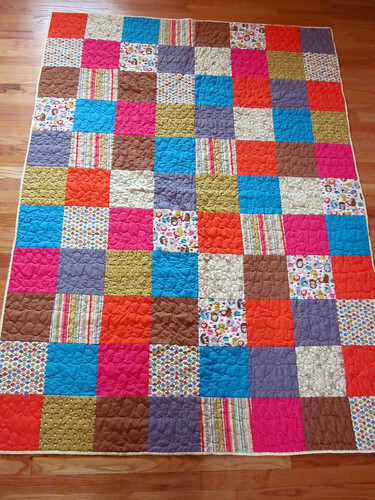 I finally bit the bullet and sent it out to be quilted a few weeks ago (best decision ever). 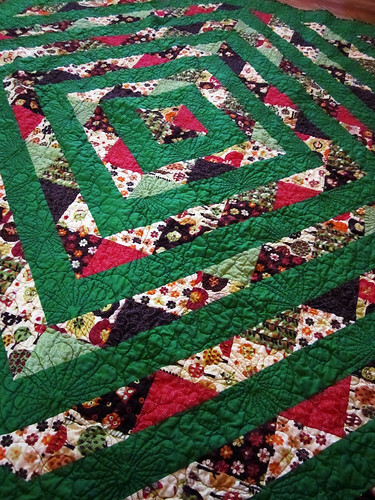 The long arm quilter did a beautiful job and it was so nice to be able to sew on the binding while admiring her work. Collection and 3.5 yards of fabric for the top. 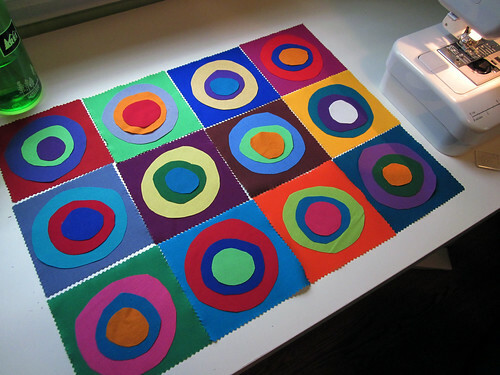 I was able to cut 12 five inch squares out of each fat quarter, for a total of 120 squares that were then cut in half. 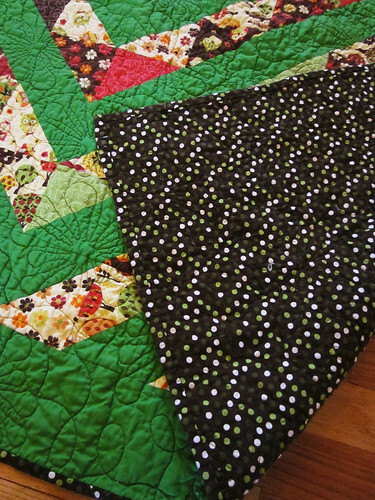 I cut the green fabric into 5" wide strips and cut out 120 squares from each strip and used the remaining fabric for a border. 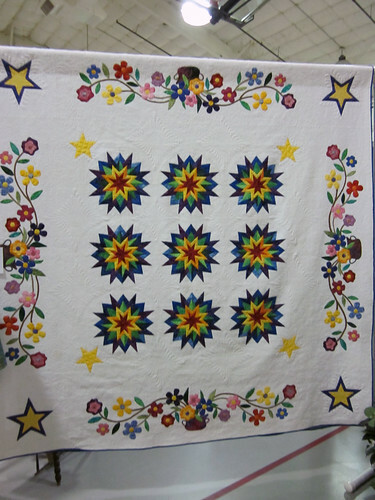 The quilt is 14 blocks wide and 16 blocks tall with a 5" border of sashing around the edge. The final quilt is 72" x 81"
The kitties have been taking turns sleeping on it in this accidental, makeshift hammock I made. 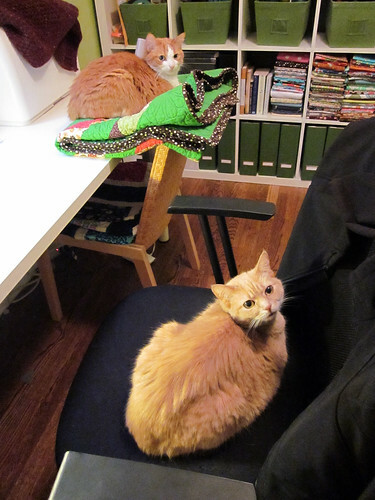 There has already been one fight (with growling and hissing) over who gets to sleep on it. Nuku nuku won this time! 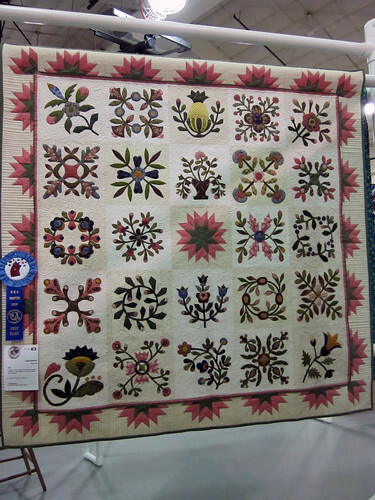 This quilt was made by my fellow Bee Beautiful Virtual Quilting Bee members. 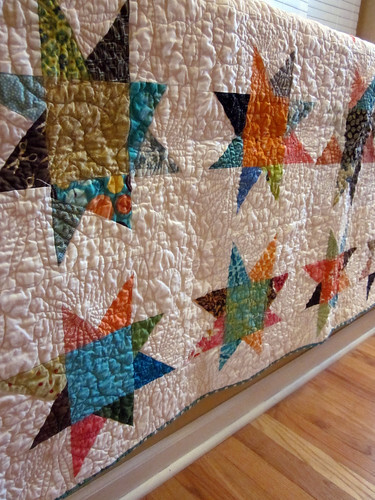 Each member contributed a few maverick star blocks to the quilt in bright colors and I sewed the top together and had it quilted by a local long arm quilter. 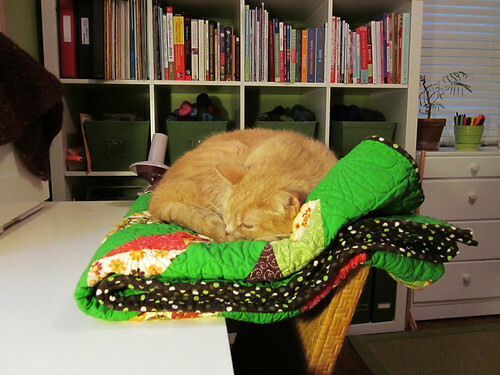 I received the quilt back from the long arm quilter on Tuesday and sewed the last bit of binding on last night. 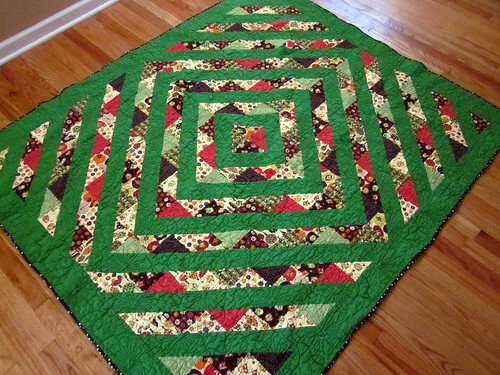 I wish I would have taken a "before washing/drying"picture because the quilting is so pretty. She did a fun daisy pattern with some wandering loops. 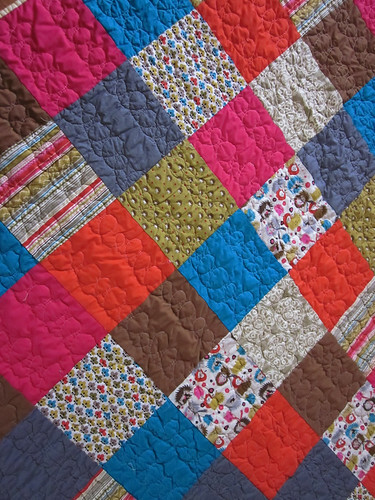 I love looking at all of the different fabrics that everyone used in their blocks. 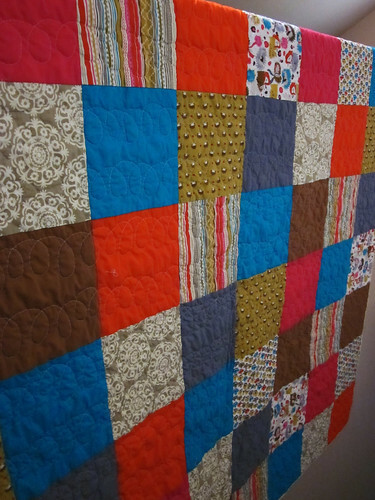 Patchwork quilts are definitely my favorite and patchwork combined with crinkly fabrics always remind me of vintage quilts. The quilt ended up being 70" x 84". 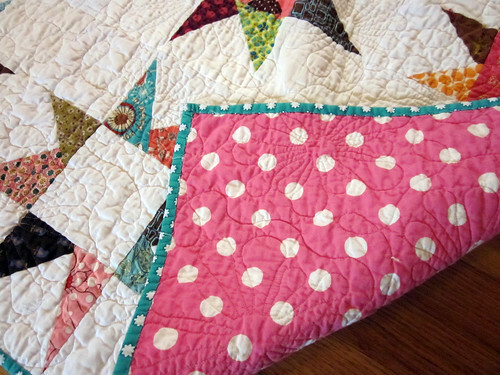 I binded it with a teal flowery polka dot print and used a big pink polka dot print for the backing. 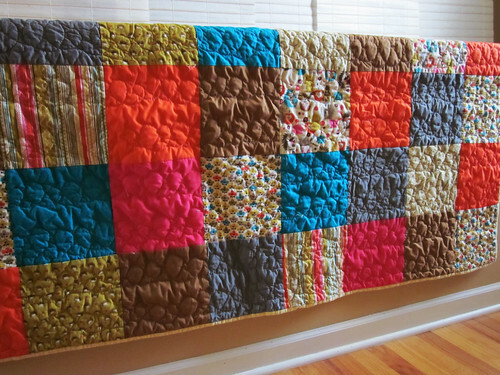 It's such a fun and cheery quilt! the collection of quilts that are going to a teen girls living at Children's Village in Detroit. I'm hoping to clear my "craft closet" of projects to do in the next few months so that I can pare down and use what I have. My reward, should I finish everything by May 31, is two skeins of Pigeonroof Studio TLS Washed baby alpaca/cashmere/silk yarn. 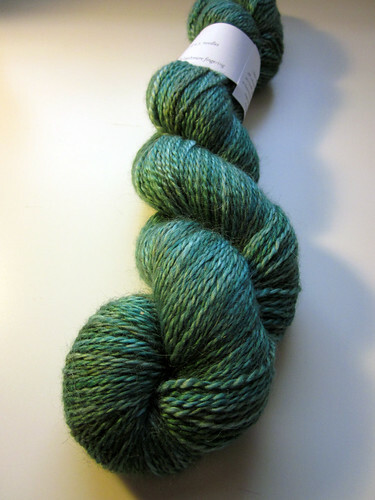 This is, by far, the nicest and softest yarn I have ever knit with and it will be the perfect reward! After basting the big zig quilt I was working on, I finally sat down to start quilting a million parallel zig zag lines. I threw in the towel after one zig zag, ripped out the quilting, unbasted the quilt and made a quick trip to Joann's to pick up some solids to make a completely different quilt. 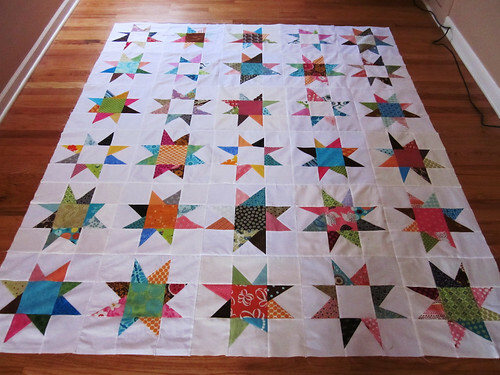 I think the big zig quilt will be cut apart and made into quilted throw pillows (much more manageable). 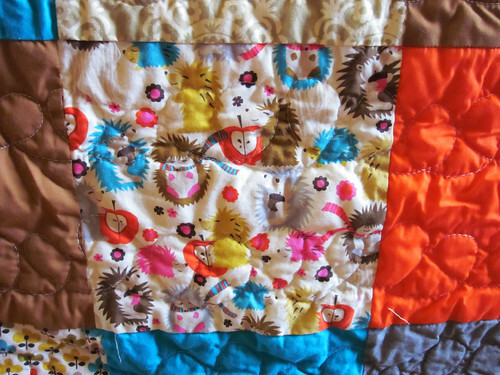 I purchased a half yard pack of this hedgehog line by Michael Miller fabrics on etsy a month or so ago ago and it turned out to be the perfect set of fabrics to use to copy Erica's signature quilt pattern (seen here, here, here and here). The blocks of fabric were cut to 8.5" x 8.5" (8" x 8" with seam allowance) and there are 8 columns and 11 rows. I used five 1/2 yards of the prints and five 3/4 yards of solids (just to be safe). The final quilt is 64" x 88". 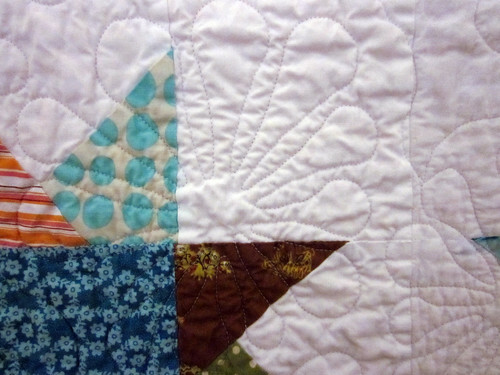 The loopy quilting is much more my style than straight lines and I love how crinkly it turned out after a toss in the dryer. 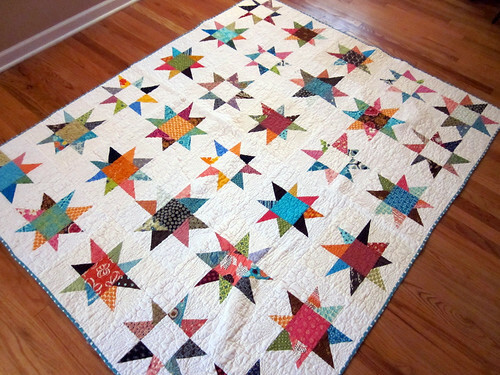 This quilt, along with the maverick star quilt made by my Bee Beautiful quilting bee buddies, is going to a teenage girl at Children's Village in Detroit. Ahh! The sweet relief finishing up my degree. Thanks so much for all of your congratulatory comments! 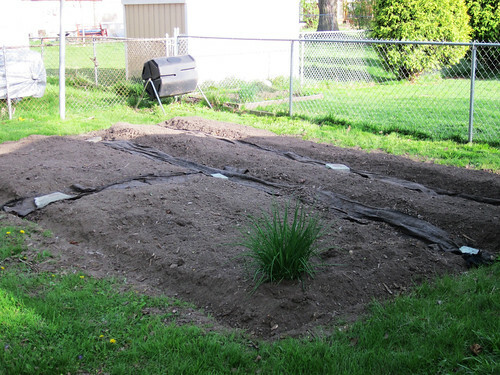 On Sunday, Jon and I were able to get our garden prepared for this summer. We weeded it, added compost from our bin, tilled it and rearranged the rows (ouch, my fingers and hands are still aching from all of that weed pulling!). Our lonely chives are looking forward to more company. We need to start adding chives to all our recipes, stat! 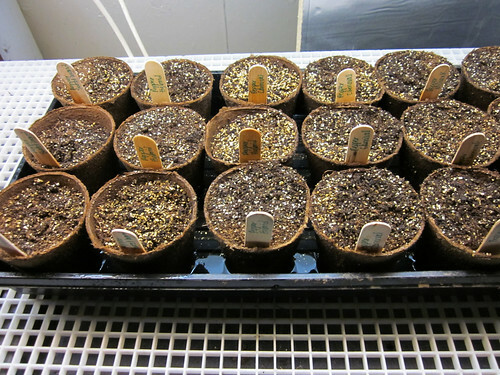 We're hoping that our second try at growing seeds inside will prove to be better than last year's failure...fingers crossed here! I stumbled across this super helpful gardening blog yesterday, digginfood, which is written by a master gardener. I think we're going to make her diy squash trellis and cucumber trellis to try and contain these plants better this year. 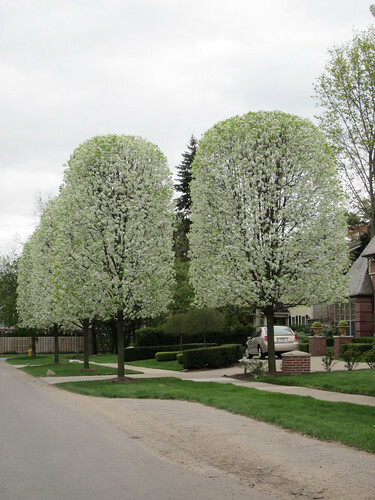 If you're into gardening, do you have any helpful sites that you frequent? 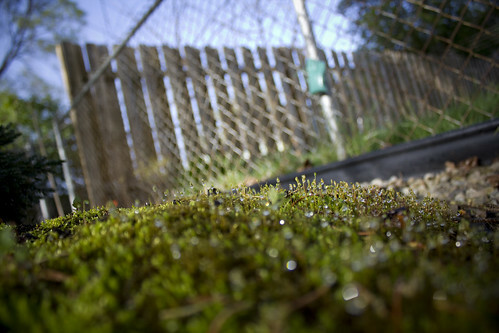 I'll leave you with Jon's photograph of his japanese garden. Jon is obsessed with growing his moss and will talk your ear off if you ask him for bonsai or moss advice...it's really cute when he gets excited about his plants. 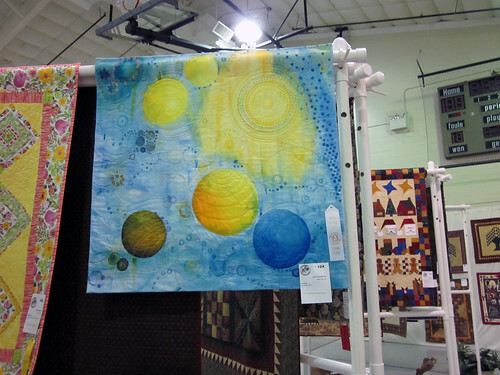 I visited the Oakland County Quilt Guild Spring Quilt Show last Friday. 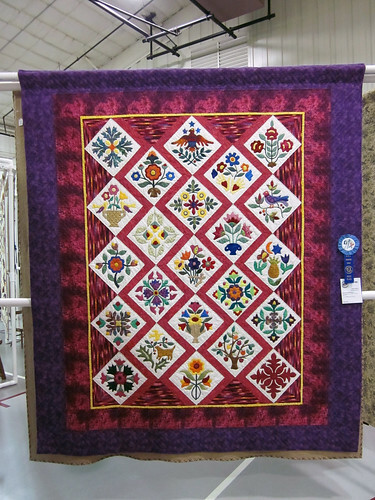 The quilts were amazing! 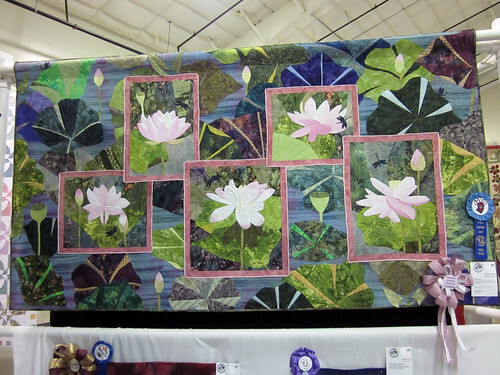 Here are a few of my favorite quilts from the show. You can view the rest of the set here. Such a cool optical illusion! 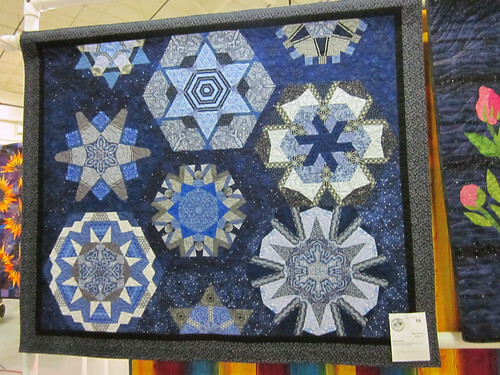 a fun space themed quilt in a sea of flowery, girly quilts. 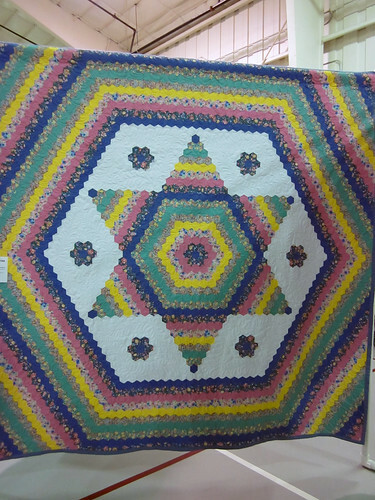 This is a Turkish puzzle quilt (I think). The top six blocks are repeated in the bottom six blocks and the trick is to find the matching pairs of blocks. 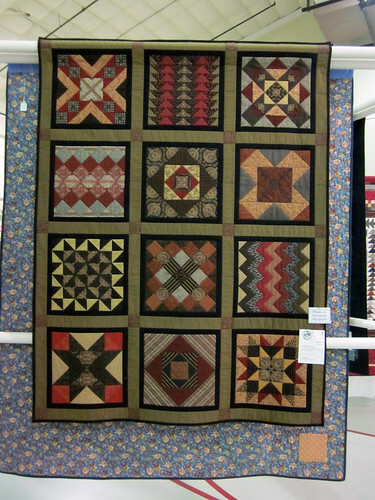 I love the rich colors in this quilt. 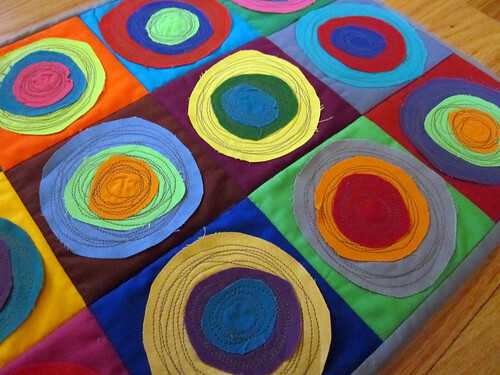 Love the bold colors and geometric design on this handkerchief quilt. I am always so impressed by beautiful applique in bright colors. 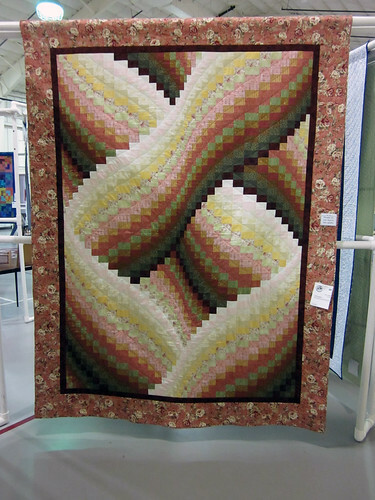 This quilt took pebble quilting to a whole new level! 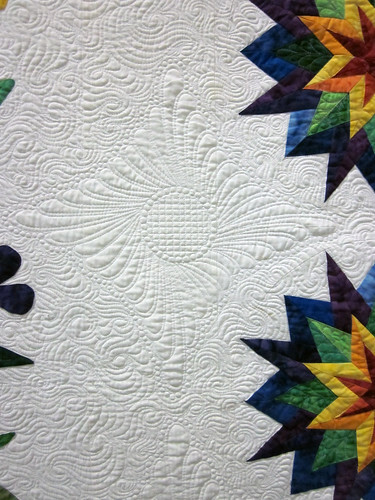 The quilting on this is unbelievable! Again, I'm a sucker for beautiful applique! 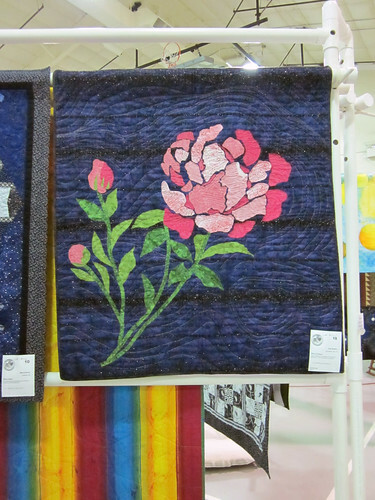 These two quilts (peony and cross) were made by the same quilter. 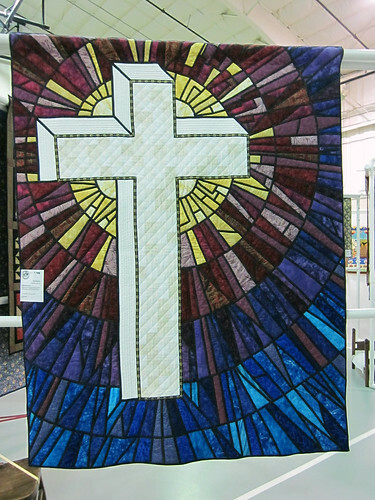 The cross quilt has been hanging in the church where the flute choir ensemble I'm in practices each week. I've been meaning to bring my camera to practice to get a picture of this quilt because it's so striking. I love the stained glass effect she created with the vibrant colors. 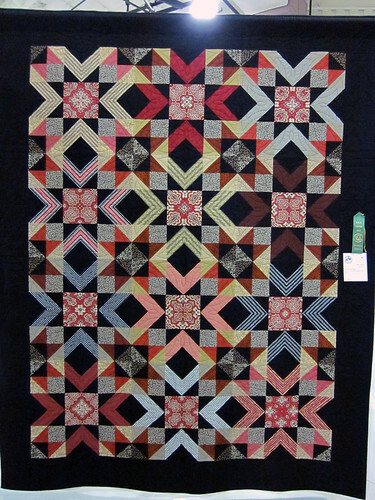 Such a cool kaleidoscope quilt. And, for all of you hexagon lovers out there, I had to throw this one in. The tag said it was made with 2,585 hexagons! Again, you can view the rest of the set here. I will be done with my master's degree next Saturday(!) and I can almost taste the freedom! I've been finishing up little projects here and there lately because that's all that I can handle in my overused brain and overtired body. 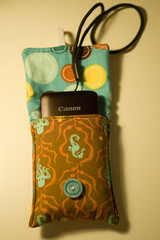 I made this a few months ago to fit my new mini camera. 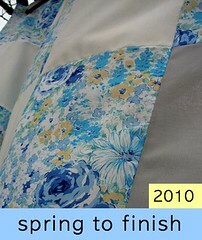 I used this tutorial from Sew Mama Sew and made the dimensions a bit smaller for a snug fit. I actually made two cases because I wasn't following directions closely and made it too small. 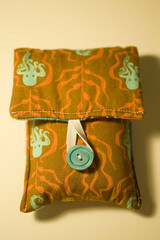 (The octopus print is facing in the right direction on the first case, but not on the final case). My only hint for the pattern is to sew the button on before sewing up the sides - it's a tight fit for a needle if you sew it on last. This is from a basic mitten pattern that I found on ravelry. 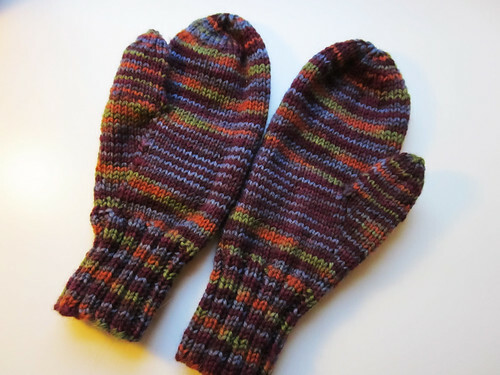 I've been wanting to work my way up to stranded mittens, so I thought I'd start with a basic pattern first to learn the details of mitten knitting. These ended up a little "off." On one mitten, the hand is too long and the thumb is to short. 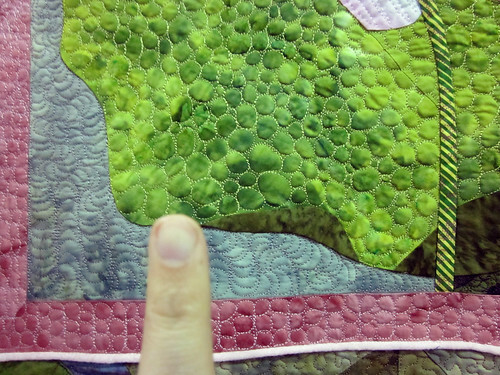 On the other mitten, the thumb is too long and the hand is too short. They fit well if I make a "C" with my hands, so I'm just going to leave them as is. Here's a link to my ravelry project for more details. 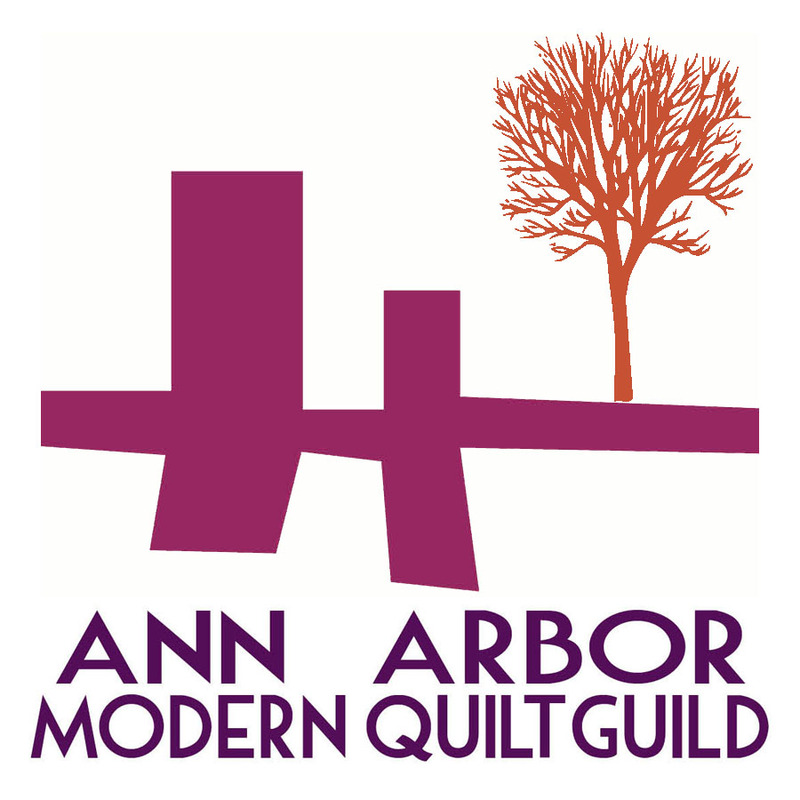 My dad recruited me to make a twin sized quilt for teen girls living at Children's Village in Detroit (his coworker is collecting handmade quilts). 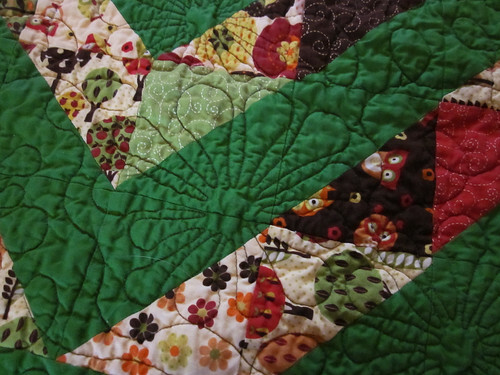 I made this quilt to donate and I recruited the ladies in the Bee Beautiful VQB to help make a second quilt. 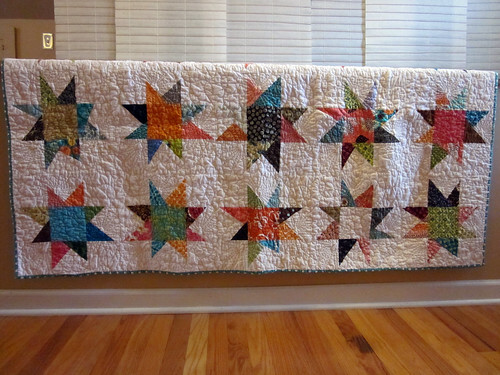 We all made Maverick Star blocks for the quilt and then I put the quilt top together and dropped it off at the long armer earlier this week. 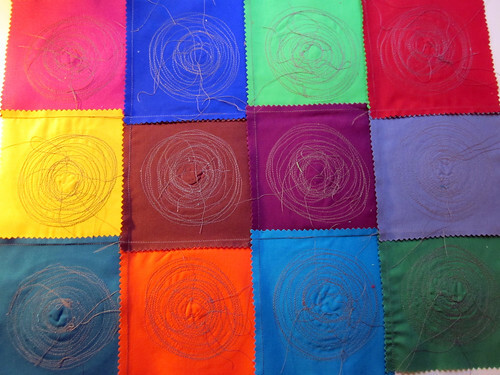 This is my first quilt being outsourced for quilting, so I can't wait to see how it turns out! 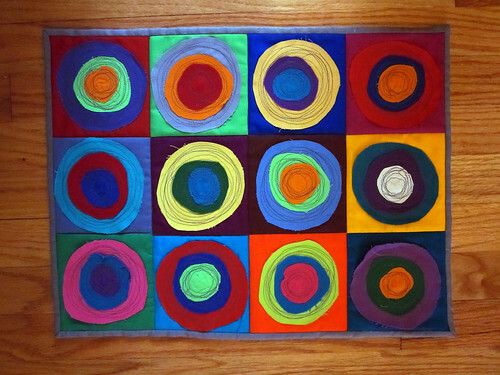 I discovered that my Doll Quilt Swap Quilt was included in a mosaic of solid quilts on Whipup today. 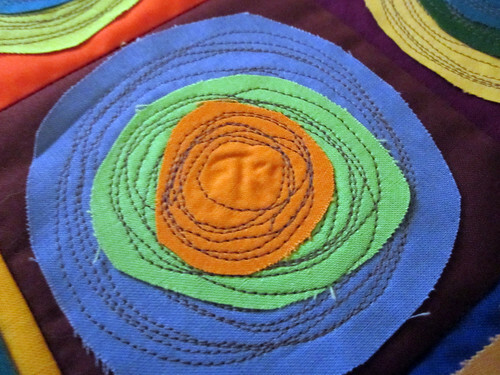 It was fun to see my quilt included in such an inspiring mosaic. 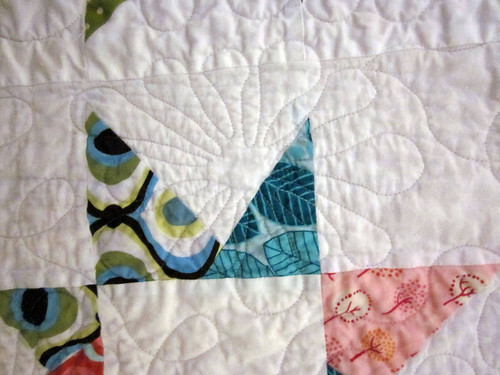 I spotted Amy's Zen Mini Quilt in there too. It was a momentous day at the library today because I ran into the person who inspired the name for my blog. Picture me back in 1990...permed hair, big purple glasses, tight rolled jeans. You get the picture. My family started going to a new optometrist's office and the doctor's assistant, Annie, welcomed me at the start of my appointment. Annie: Hi Rebekah. Do you go by Becky? She continued to call me Becky throughout the appointment and introduced me to others in the office as Becky. Optometrist: Hi Rebekah, do you go by Becky? Optometrist now thinks my name is Becky. Unfortunately, the optometrist's office was quite large and there were four doctors and countless receptionists and assistants on staff. Annie was very insistent that everyone in the office called me Becky, no matter how hard I tried to assure people that I really did go by Rebekah. Annie was really sweet and always helped me pick out the cutest glasses and patiently taught me how to put in contacts for the first time, but she never caught on to my correct name. It's been about ten years since I've been to that particular office, so it caught me off guard to see Annie in a different environment at the library.